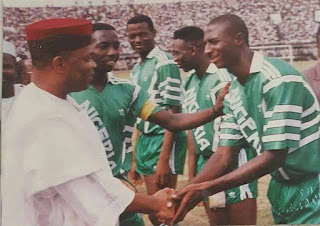 Samson Siasia Introducing Members of His Team to The Then Chief Of General Staff and Vice- President,Late Admiral Augustus Aikhomu during The Tunisia 94 Nations Cup Qualifier In 1993 Against The Cranes of Uganda Inside The Main-bowl Of The National Stadium Surulere Lagos. On That Same Day, Coach Westerhorf Capped a Certain Kano Pillars Forward, Akin Akinsehinde. This is back in the days when players from the local league formed the integral part of our national team.